In this age of selfies and corporate scandals, the need for humility is pressing. 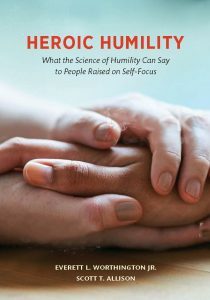 This book entitled HEROIC HUMILITY offers a synthesis of research and theory on humility and heroism. It articulates a vision of heroic humility — humility of such great depth that it inspires others. Humility has three parts: an honest self-appraisal (including an attitude that one is teachable), modest self-presentation, and an orientation to build others up and not put them down. Moreover, humility can be learned. People who embody heroic humility not only rise to moments of great humility, but practice it and emerge from frequent tests of their humility throughout life. Thus, this book likens the formation of a humble character to a hero’s journey, with a “call,” a journey through challenges and temptations, a descent into one or more abysses, and a redemption. With an impressive array of examples—such as Mother Teresa, Malala Yousafzai, and Abraham Lincoln — the book illustrates that no two heroes’ journeys are identical. Readers are challenged to embark on their own journey of heroic humility in their work, service, and personal lives. Heroic Humility is authored by Everett L. Worthington, Jr., and Scott T. Allison. It will be published by the American Psychological Association, and is now available for purchase.